All aprons are NOT created equal! I mean, these are meant to get a little dirty and save your fancy outfits underneath, right? 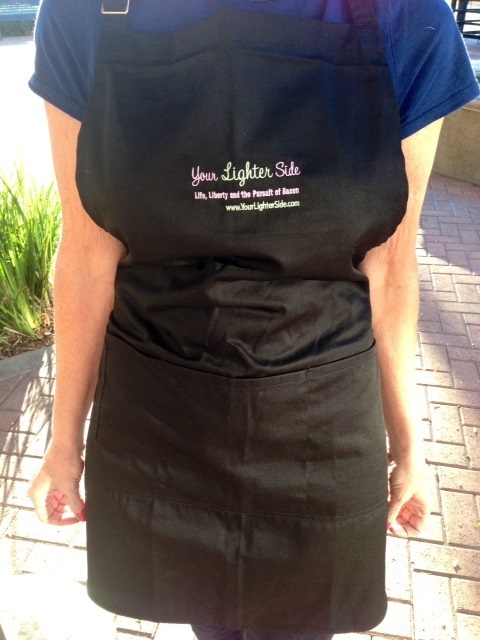 Well the YourLighterSide apron will not only protect the ball gown or tuxedo you are wearing as you cook, you will look amazing wearing it! The apron has a Teflon stain release finish, so bring it on the splatter, I dare you! There are four pockets so you can stash the printed out recipe, your cell phone, bacon… anything you need to store while using your hands to make magic happen in the kitchen! The back ties and adjustable neck strap holds the apron in place, so this will comfortably fit just about anyone! 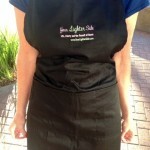 It is 30” tall and 24” wide, so plenty of surfaces will be protected as you look sleek in this black apron!